July 25, 2004  Musician Gary Nunez and his band, Plena Libre, revive and re-invent the rhythmic Puerto Rican musical style known as plena. July 25, 2004  Weekend Edition film music commentator Andy Trudeau speaks with NPR's Liane Hansen about the life's work of composer Jerry Goldsmith, who died this past Wednesday at the age of 75. Though he created hundreds of film scores and won an Oscar, Goldsmith never achieved the fame of some of his peers. July 22, 2004  Singer-songwriter Joseph "Amp" Fiddler's debut CD, Waltz of a Ghetto Fly, is a fusion of classic Detroit soul and modern electronic funk. Day to Day producer Christopher Johnson talks with Fiddler. July 22, 2004  NPR's Tavis Smiley talks with the great George Benson about his long career and new album, Irreplaceable, which is dedicated to the younger crowd. July 22, 2004  Academy Award-winning composer Jerry Goldsmith dies at the age of 75 after a long battle with cancer. Goldsmith composed a number of memorable scores for films such as Total Recall, Star Trek, and Planet of the Apes, and TV shows such as Perry Mason. Pat Dowell reports. July 21, 2004  NPR's Tavis Smiley speaks with new R&B sensation Ricky Fante, whose debut album, Rewind, harkens back to the sounds of Otis Redding, Wilson Pickett and Al Green. July 20, 2004  NPR's Robert Siegel talks with Placido Domingo, general director of the Washington National Opera, about the life and work of conductor Carlos Kleiber, who died last week. Kleiber was known both for his eclectic performances and his independence. July 17, 2004  The Susie Arioli band, out of Quebec, has just released its third jazz-swing album, That's for Me. NPR's Susan Stamberg speaks with vocalist Arioli and guitarist Jordan Officer about their music, inspiration and collaboration. 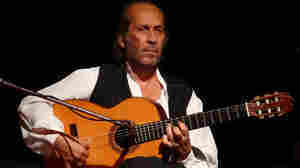 July 16, 2004  Paco de Lucia's music combines a fierce allegiance to tradition with an appreciation for contemporary genres. July 15, 2004  Metallica is one of the most popular bands ever — but not long ago, their rock 'n' roll empire was in danger of crumbling. The documentary Some Kind of Monster captures the band undergoing group therapy. July 14, 2004  Unlike many American rappers, Biritsh hip-hop artist Mike Skinner, a.k.a. The Streets, does without the hype. His new CD A Grand Don't Come for Free is a self-deprecating, humorous song cycle.